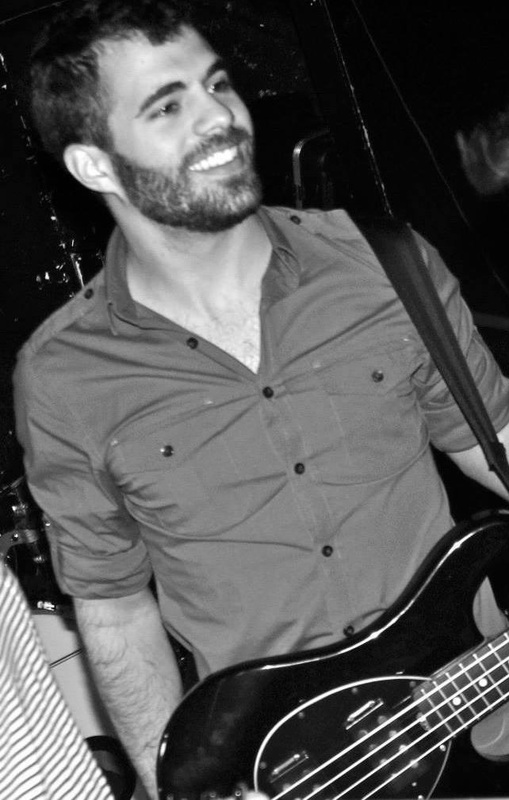 Michael Zevin is a third-year doctoral student in astrophysics at Northwestern University. He is a member of the LIGO Scientific Collaboration, and in addition to citizen science and LIGO detector characterization his research focuses on utilizing gravitational-wave detections to learn about binary stellar evolution and the environments in which compact binaries form. With the first observations of gravitational waves and the discovery of binary black hole systems, LIGO has unveiled a new domain of the universe to explore. Though the recent signals persisted in LIGO’s sensitive band for a second or less, these last words of the binary that were spewed into the cosmos provided an unprecedented test of general relativity and insight into the progenitor stars that subsequently formed into the colliding black holes. However, the hunt is far from over. With LIGO’s second observing run underway, we can look forward to many more gravitational-wave signals, and as is true with any new mechanism for studying the cosmos, we can also expect to find the unexpected. The extreme sensitivity required to make such detections was acquired through decades of developing methods and machinery to isolate the sensitive components of LIGO from non-gravitational-wave disturbances. Nonetheless, as a noise-dominated experiment, LIGO is still susceptible to a variety of instrumental and environmental sources of noise that contaminate the data. Of particular concern are transient, non-Gaussian noise features that plague the detectors known to as glitches. Glitches come in a wide range of morphologies, can mimic gravitational-wave events, and occur often enough to be a major contaminate in the search for true signals within the data. The detriment of glitches can be ameliorated by understanding the root causes of different glitch types, allowing their catalyst to be fixed or data segments with these glitches to be automatically removed from the searched data. Therefore, the proper classification and characterization of glitches is paramount in helping LIGO realize its design sensitivity capabilities. Because of the wide range of causes and morphological properties of glitches, it is exceedingly difficult for computer algorithms to comprehensively classify all the glitches that present themselves in LIGO’s data. Furthermore, as hundreds of thousands of glitches occurred in LIGO’s first 3-month observing run alone, the sheer quantity overwhelms the abilities of any small group of scientists. Therefore, we have turned to another powerful tool used in large-scale data analysis – crowdsourcing. The current advanced-user Gravity Spy interface. Visit www.gravityspy.org to try it out yourself! In our paper we present the Gravity Spy project, which utilizes volunteers from the general public, known as ‘citizen scientists’, to perform large-scale data analysis of glitches within LIGO’s data stream. Gravity Spy is hosted by the Zooniverse platform, which harbors dozens of citizen science projects across many scientific disciplines. Such projects have proven to be quite prolific, as classifications by the 1.5 million registered Zooniverse users have already led to hundreds of scientific publications. This project, however, takes a step further than just unleashing swaths of LIGO data to the general public. 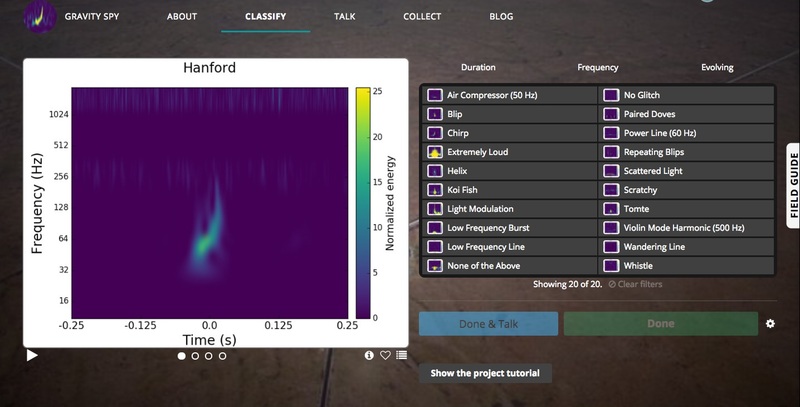 Gravity Spy addresses the task of classifying glitches through the convergence of four science areas: gravitational-wave physics, human-centered computing, machine learning, and citizen science. Specifically, it leverages the advantages of citizen science along with those of machine- and human-learning techniques to design a sociocomputational system whic optimally analyzes and characterizes LIGO glitches and improves the effectiveness of gravitational-wave searches. Gravity Spy couples human classification with convolutional neural network machine-learning algorithms in a symbiotic relationship: volunteers provide large, labeled sets of known glitches to train machine learning algorithms and identify new glitch categories, while machine learning algorithms “learn” from the volunteer classifications, rapidly classify the entire dataset of glitches, and guide how information is provided back to participants. The project also utilizes a training regimen that is unique to Zooniverse, where new users are given glitches that are classified at a higher confidence by the machine learning algorithm, whereas experienced users are given glitches with lower machine-learning confidence that are more likely to be novel glitch types. Gravity Spy also includes research on the human-centered computing aspects of this sociocomputational system, as empirical testing of the human-computer interface leads to better project design and an enhanced performance of citizen science volunteers. The data challenges faced by LIGO are not unique. The increasingly large datasets that permeate every realm of modern science require new and innovative techniques for analysis. Though crowdsourcing has proven effective for data analysis endeavors to date, the exponential growth of data acquisition necessitates smarter ways to perform citizen science. The Gravity Spy system aims to accommodate this by providing data tailored for each volunteer based on their experience to expedite the accurate analysis of images. By integrating human and computer classification schemes in this way, citizen science will maintain its role as a prolific scientific tool and scale with the ever-increasing size of future datasets. The project was launched to the general public on October 12 2016. Prior to the launch, the team was uncertain as to how popular Gravity Spy would be, as the primary objective of the project is to characterize noise rather than uncover hidden gravitational-wave signals. However, our concerns were quickly pacified. Since the launch, we have already accumulated over one million classifications from thousands of registered users, which has led to growing sets of labelled glitches and the discovery of multiple new and prominent glitch categories that were negatively affecting gravitational-wave searches. This success is a testament to the desire of the general public to contribute to scientific advances, and the curiosity of non-scientists in large-scale scientific endeavors. To find out more, read our paper in Classical and Quantum Gravity and join the science today at http://www.gravityspy.org! This entry was posted in Author Insights, IOPselect, Special issues and tagged gravitational wave detectors, gravitational waves, LIGO by David Jones. Bookmark the permalink.